I am including another photograph. It is of Edward (known as Ted) and Sarah Marple, taken I believe in Middleton. 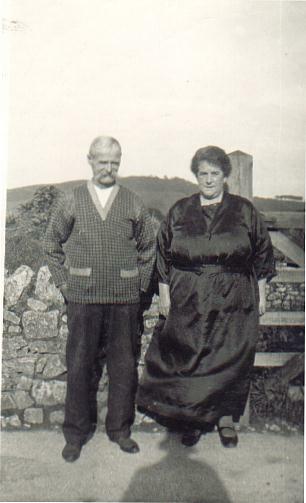 They were married 24 Dec 1892. Edward was the son of Aaron and Mary Marple. He was christened 13 Jul 1864. According to the records his mother died in 1879 and his father in 1880. Edward is living with two Mather ladies in 1881. His mother was Mary Mather. Edward's younger brother, William Marple c. 24 Feb 1869 was living with William Doxey (Butcher) and family at Rise End in 1881 and it says William was an orphan.